Nowadays, we usually travel with kids. Unless, of course, it’s for work or business. I don’t like leaving them behind, and it’s not just because they don’t have nannies. Honestly, I don’t like them missing out. Such as a having such a nice stay at Marco Polo Plaza Cebu. Note: Our family was accorded a one-night complimentary accommodation at Marco Polo Plaza Cebu. 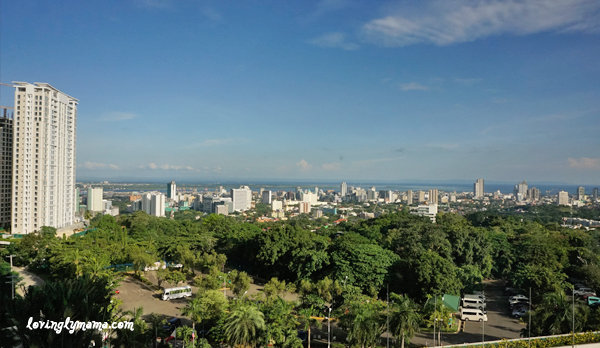 Marco Polo Hotel Cebu sits atop a hilly area of Cebu City. The place is called Nivel Hills in Apas and is actually dreamy. It is quite a distance from the downtown area, but it’s not so far as to consider the area remote. But, it is just enough distance so that you can hie off to a serene location after a hectic day of doing business in Cebu proper. It’s no wonder that the country’s flag carrier, Philippine Airlines, has chosen this hotel as the official residence of their crew in Cebu. The imposing structure of Marco Polo Hotel Cebu. The air here is quite fresh, thanks to the elevated area and verdant surroundings. There is just something homey and beckoning at Marco Polo Plaza Cebu. 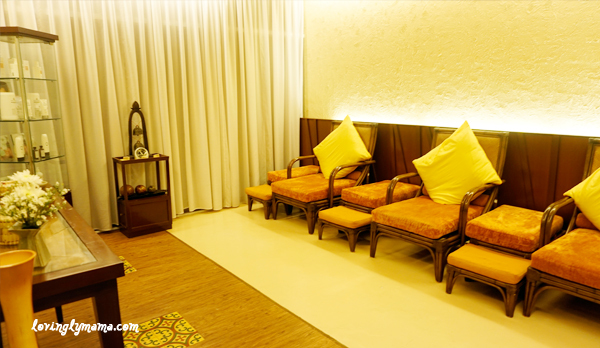 Despite its grandeur and elegance, there is something about it that speaks about the warmth of home. Our view from the 8th floor common area near the elevators. Marco Polo Plaza is an imposing structure on a hill. 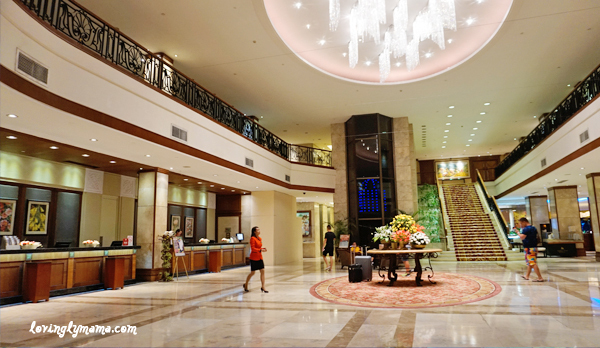 When you enter the hotel, saying that the lobby is big is an understatement. It is expansive and grand, like almost the size of a gym of a regular school. The very spacious and grand lobby. The lobby is so huge that even if a bus-load of tourists arrived at the hotel lobby for check in, the place doesn’t feel cramped at all. And yeah, we experienced that when a bus full of Korean tourists arrived. On the right side of the entrance is a desk for Discovery Loyalty Program members. Further down on the left is the reception area manned by pleasant and good looking staff. We were billeted in the Deluxe Mountain View Room. It’s a 32 sq m (349 sq ft) room on the 8th floor that features two double beds. It was enough to accommodate two adults and two young kids, but the management was kind enough to set up an extra bed for our eldest daughter Dindin. Our deluxe room. Bed was sooo comfy! Our room was quite spacious, with lots of room to move around. This is especially good if you have young and very energetic kids. It is lighted well enough and there are no dangerous turns. It’s well suited for a family with young kids. There’s a table for me to work on that comes with a comfortable reclining chair. My view in front of my bed. And oh, they have quite a number of outlets for charging. Our toilet and the robe. 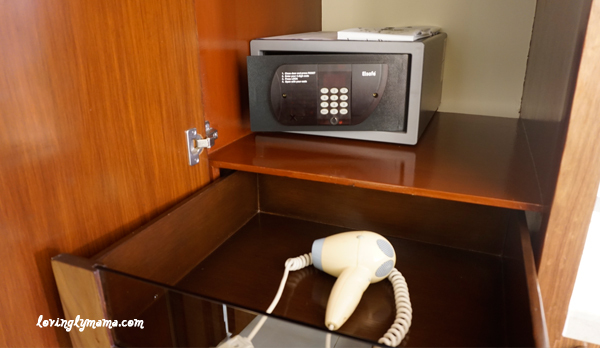 The safe and dryer in the room. 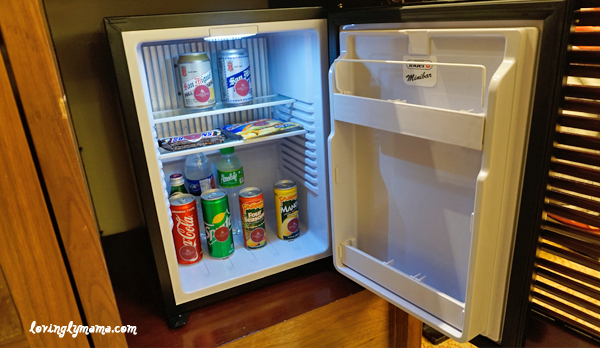 The mini bar inside our room. Marco Polo Plaza Cebu has some of the nicest and well-maintained amenities that a hotel guest would thoroughly enjoy. 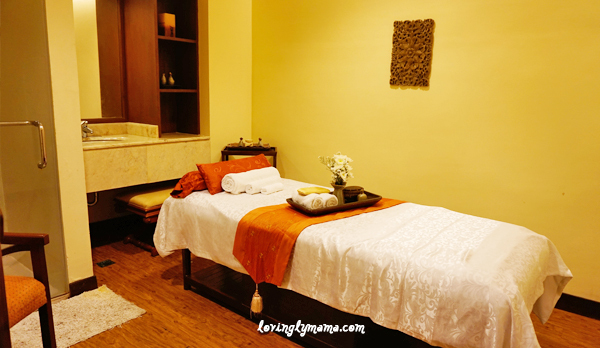 One of the six massage rooms at the spa. It has it’s own shower room and dresser area. 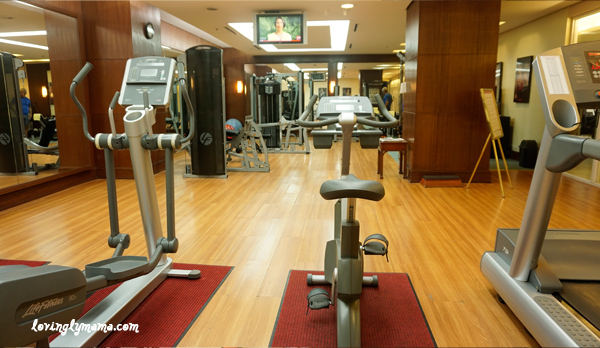 The modern and well-maintained fitness center. 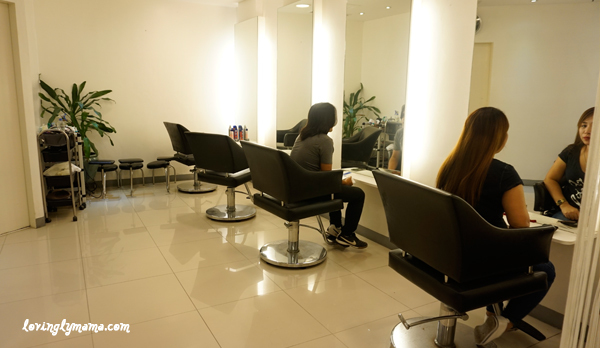 The Korean hair and nail salon. The kids and I especially appreciated the swimming pool because it’s rather shallow. That means it’s safe for young kids. Shane stayed in the kiddie pool most of the time. We had great bonding moments there as we played around. Mother and daughters swim time. The swimming pool of Marco Polo Plaza Cebu. Marco Polo Plaza Cebu has a total of eight function rooms that can accommodate small to large-scale events. It includes the Cebu Grand Ballroom that can seat up to 1,200 for a theater or cocktail setup. 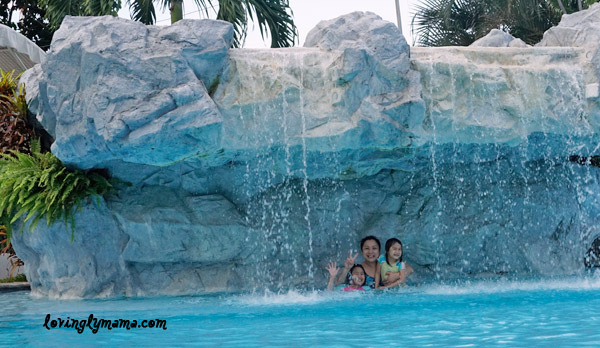 We loved staying at this area of the Marco Polo Cebu swimming pool. It was so much fun splashing here. Meanwhile, the Grand Balcony can contain up to 900 people for a banquet and 1500 for a cocktail setup. They have state of the art facilities and experienced event planners who can help you with any event you might have. 24-hour Hotel Services at Marco Polo Plaza Cebu. The clinic is open 24 hours for minor emergency treatments. There are four elevators, so there’s practically no waiting to go up and down. For the safety of the guests, the key card is required to access the floor. 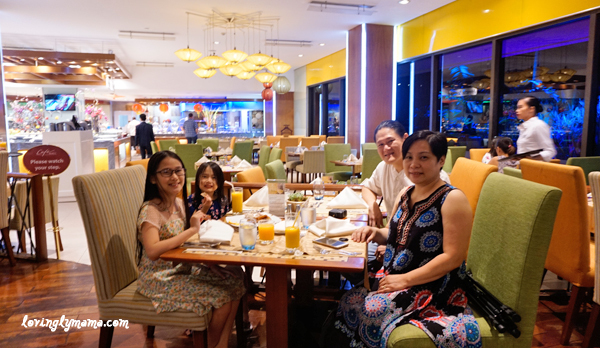 Generally, the staff that we encountered at Marco Polo Plaza Cebu were all very gracious, able, and and accommodating. This stay may have been a blog collaboration but it’s not like the whole hotel was informed about my stay. Nevertheless, we enjoyed their warm hospitality. Even a friend of mine who has stayed there before with her family has commented about the staff’s general good attitude towards work and their guests. The staff also spoke in English, even those who just gave out towels by the pool. They replied to me in English, even though I tried to interact with them in Cebuano. That is good, because of all the many international guests they receive. They also have a Korean national in their front desk, which tells me they have a high traffic of Korean tourists guests here. Rooms at Marco Polo Hotel Cebu start at P7,000 for regular occupancy. Promos, advanced booking, and corporate discounts also apply. They have the exclusive continental rooms and suites on the top most part of the building. These have their very own private amenities, such discreet entrance and exits. Such a fab hotel! All these perks are for very important travelers! At the hotel, there is free wifi access in practically every nook and cranny. All the guests need to do is to log in their room number and last name for the username and password. However, I am not sure how this works for non-hotel guests. 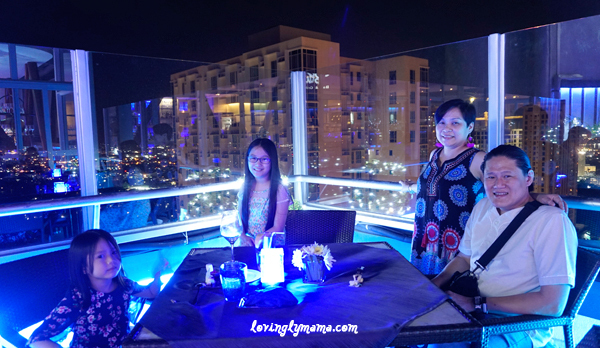 We only stayed overnight at Marco Polo Hotel Cebu so I was not able to try their restaurants, which includes the Blu Bar and Grill at the rooftop. But we did have the dinner and breakfast buffet at Cafe Marco, which we totally enjoyed. The centerpiece of Cafe Marco. 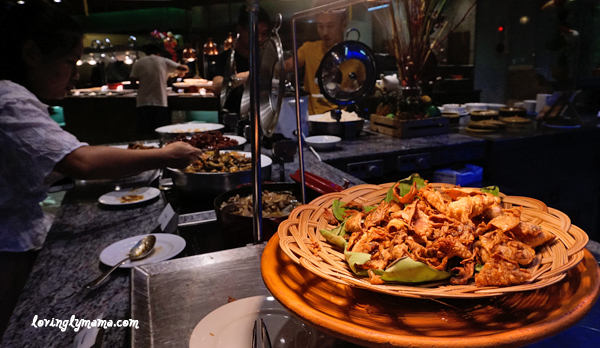 The dinner buffet has more than 50 dishes–from appetizers to desserts. I did not eat much but I tried to sample as many dishes as I could but they all turned out so good. Of course, I did not skip the Japanese station where I had a heap of my favorite salmon sashimi and then I sample their sushi. 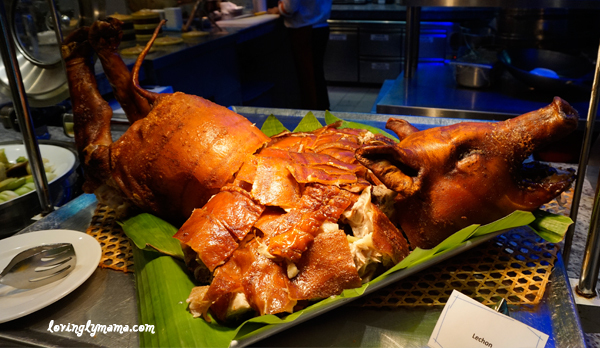 For the dinner buffet, there is a whole small lechon de Cebu (roast pork)! Plus, the salads and the Chinese station. I super duper enjoyed their dimsum! We are such siomai eaters! 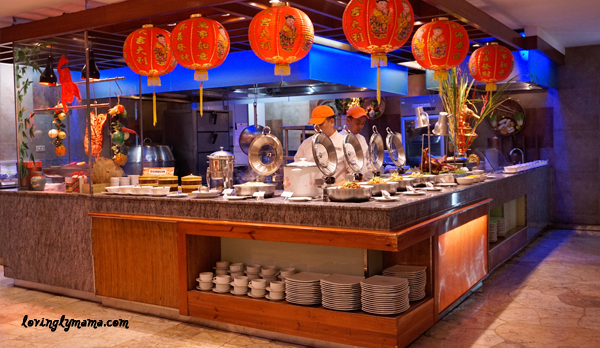 This is the Chinese station of the buffet at Cafe Marco. Do not miss the dimsum. Promise! Then, of course, the desserts. My goodness, I am not sure how many kinds of sweets there were. I think there was closed to 20 different kids, which included their award-winning Malicious Chocolate Chip Cookies. We bought some to bring back to Bacolod. It’s P49.50 for two pieces and best eaten warm. I just popped outs in the oven toaster for about 2 minutes. The Japanese station that my daughter frequented. She was in love with the tempura. Glad that she’s now appreciating diverse food. Dindin, our eldest, who has a limited palate, sampled a lot of things and zeroed in on her favorites. There were a lot of selections that she liked and she also loved the cooking. 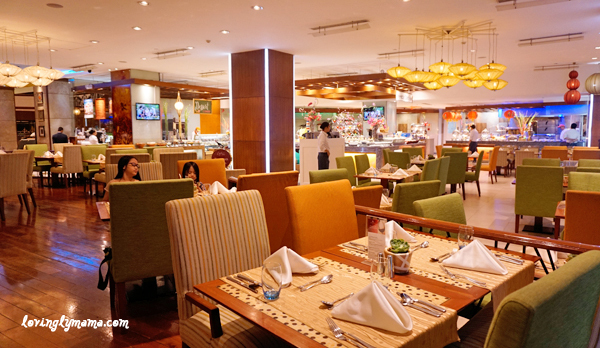 The dinner buffet at Cafe Marco is P1625 per person. Children until 12 years old are charged only 50% while kids who are 4 years old and below are free. Except for coffee and tea, all the drinks are charged separately. But international guests need not fret. 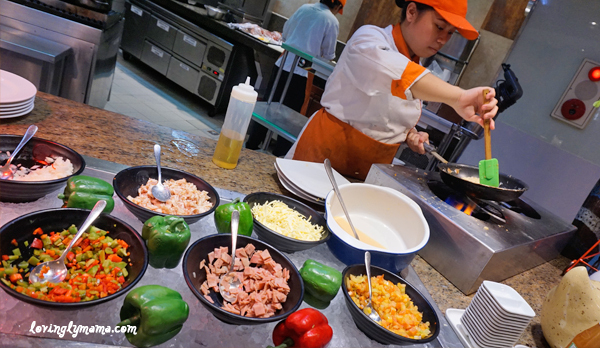 There’s Japanese food, Chinese food, noodles, cold cuts, different kinds of breads and pastries, muffins, freshly squeezed fruit juices, cereals, and of course, a healthy options bar. I totally enjoyed the crispy fried pusit with the fried rice! By the way, I would like to mention that refills were very fast. They have a lot of healthy food offerings for breakfast as well as some nutritional recommendation on why we should eat healthy. Surely, diet-conscious people would really be happy here. 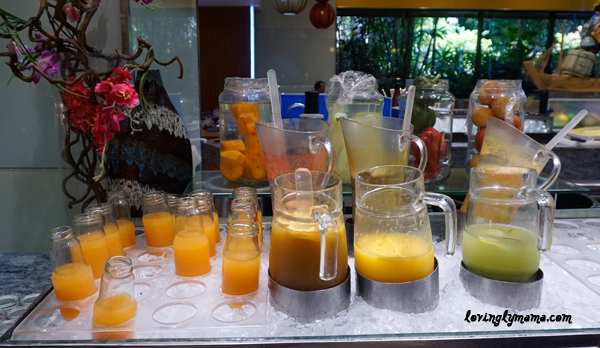 Fresh fruit juices for breakfast. Our family at Cafe Marco. Marco Polo Plaza Cebu is the place to stay, especially in that Mountain View Deluxe Room. They sure provide wonderful accommodations. Not sure about the pig though! What a nice hotel! Marco Polo Plaza Cebu seems to have all the amenities you would want for a family vacation or even a business conference away from home. I really like the pics of you and the girls chilling in the pool! You looked like you all had an amazing time! 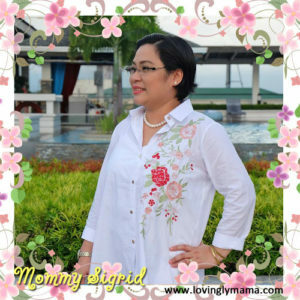 ive never heard of Marco Polo hotel Cebu but it seems GREAT for families like you said! Shallow swimming pools are always something i enjoy as well because I have small kids 🙂 i’m glad other hotels are taking notice! WOW. I’ve absolutely love to stay in any hotel as extravagent as this. Marco Polo Hotel Cebu seems like almost a dream. It looks like it would an absolutely incredible to stay there at Marco Polo Cebu. I would love to visit a hotel like that. Such great amenities, great rooms, and great food. What a beautiful place to stay and amazing location. The views are stunning. I have never stayed anywhere like this before. Marco Polo Plaza Cebu is surely worth it. oh my! This SPA is practically asking me to grab my stuff and come for relaxation! Marco Polo Plaza Hotel Cebu looks superb! 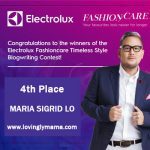 I love to discover new places through blogs! Thanks for introducing me to this luxurious hotel. I’m saving for my stay in Marco Polo Plaza Cebu for the next time I will be in town 🙂 You have a beautiful family by the way! The room looks very spacious and I love the pool! I think it’s a great place to stay as a family! Glad you liked it and had a wonderful stay at Marco Polo Plaza Cebu! Marco Polo hotel Cebu looks divine, a lovely place to visit and to relax! It’s a gorgeous place to stay and amazing location too! Great sharing. This sounds like a really nice hotel. Great amenities, great service, and great food. Marco Polo Plaza Cebu sure is a lovely hotel for the family. I would love to explore this place and have fun. Finding new places through blog excites me to plan a trip soon. Very good pictures of Marco Polo Plaza Cebu 🙂 and you are having beautiful family. This place looks so amazing. 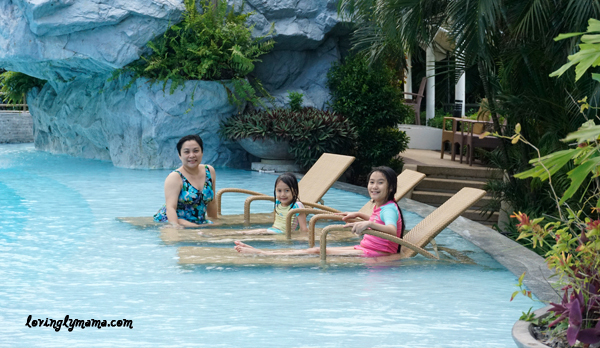 Every aspect for a good family time is covered at Marco Polo Plaza Cebu. I am sure it would have been too much fun for your family. I especially loved the pool time as it looks so relaxed for mums to have fun with kids. Wow! 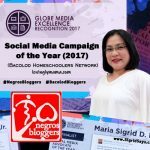 I have never tried Marco Polo Cebu but after reading this, we will definitely consider this during our next trip to Cebu. Glad to know their rates are worth the experience and the service. Marco Polo Plaza Cebu looks like a great place to stay, I am going to have to consider that on my next trip to Cebu. The food looks amazing and it looks like you and your family had a good time. Wow, Marco Polo Plaza Cebu looks like a really wonderful place to stay, with one’s family or without. I love all the amenities and that Cafe Marco centrepiece is very impressive with all those good things to eat! Marco Polo Plaza Cebu looks like a nice place to stay for the family vacation. Your pictures speak for itself how beautiful getaway it is! Your kids definitely look very happy! Marco Polo Hotel Cebu looks very classy and amazing certainly. It’s a great place to stay when in Cebu. Se manifique moments captured. Great views and vibes at Marco Polo Hotel Cebu. Would love to visit this place someday. Omg! WOW! Marco Polo Plaza Cebu looks like a wonderful place to stay. I would love to travel there. Marco Polo Plaza Cebu looks amazing! I love your food shots! They have lots of variety. I would love to stay there with my family too! Such an amazing hotel to stay. The amenities at Marco Polo Plaza Cebu look pretty lavish and the food shots are just perfect. Food look mouth-watering! I would love to stay here with my family, too. Thanks for sharing your hotel experience at the Marco Polo Plaza Hotel Cebu. It really looks like a great place to be. The food looked so good! The roast pig is making me hungry -). Love the lobby almost too big. I think I got an idea for a new shower door. Thanks for sharing your experience at Marco Polo Plaza Cebu. this place looks stunning! I love the bath set and the pool look amazing 🙂 I wish I will spend a night or two in such a place! If we go to Cebu, will really stay at Marco Polo Plaza Cebu. Marco Polo Plaza Hotel Cebu looks like a wonderful place to stay, either for a vacation or a business trip! Looks like there are a lot of great amenities there. Thank you for sharing your experience! Wow, that lobby alone had me sold! I bet that sunshine and environment was great! Marco Polo Plaza Cebu is a good choice. Wow, it seems like you are spoiled for choice with food at this hotel! I also love the complimentary slippers . . . I am always wary of walking around in my bare feet at hotels. Marco Polo Plaza Cebu is certainly worth it. Price is reasonable, too. Marco Polo hotel Cebu looks like such a pleasant place to stay. The food looks great and I love the homely yet luxurious decor feel to it. And it’s huge! The grand lobby is indeed grand! Wow. The Marco Polo Hotel Cebu is THE place to stay when in Cebu. I like the pool. So relaxing! Oh, and I would love to have my hair and nails done at that Korean salon. Marco Polo Plaza Cebu sounds lovely. I like the decor a lot. Good to know the staff were gracious. This looks like such a great place to stay! 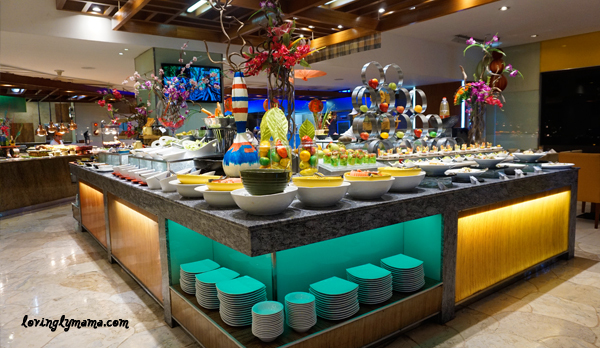 The buffet looks exquisite and the health spa speaks to my heart 🙂 Marco Polo Plaza Hotel Cebu is definitely in my list of nice hotels in the Philippines. The Marco Polo Hotel Cebu seems like a great family friendly hotel. One of the things I look for in a hotel is friendly staff. Glad to know they have that there, it made your stay really memorable. This looks like a fun place to go 🙂 Would love to visit it with my family soon. 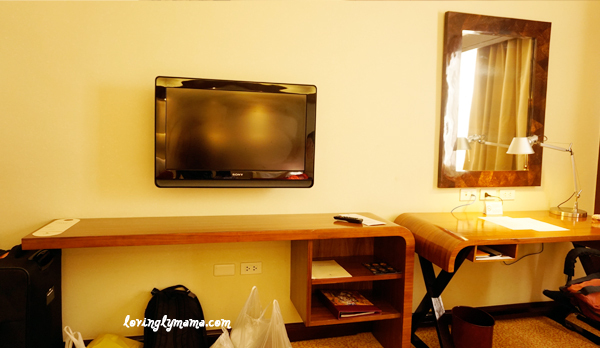 Marco Polo Plaza Cebu is a good choice to stay in when in Cebu. What a lovely little hotel in the Philippines! So nice clean and very stylish. It would be very comfortable to stay at the Marco Polo Hotel Cebu. I would love to stay at this hotel. Marco Polo Plaza Hotel looks fabulous. I love the rooms. I want to go to Cebu and stay in this plush yet affordable hotel! Marco Polo Plaza in Cebu looks great and I like the amenities they have on the property. This hotel is pretty much all-inclusive with a hair and nail salon, massage rooms and spa, and adult and kiddie swimming pools. The breakfast and dinner buffet looks delicious! Marco Polo Plaza CEbu seems to be such a luxurious hotel with great amenities. I love all of the pictures of your family. You truly enjoyed your family stay there. I don’t know if I could eat that roast pig. There’s something about the whole pig being there and eating it’s insides. I know that’s what meat is, but you usually don’t see the head. I love the pool and that they have those little chairs in it. Overall, the Marco Polo hotel Cebu looks like quite a nice place to stay. The photos of Marco Polo Plaza Cebu kept getting better and better… the room, the pool, the buffet! It all looks amazing! Thanks for sharing! It looks like you all had an amazing time at this beautiful place. 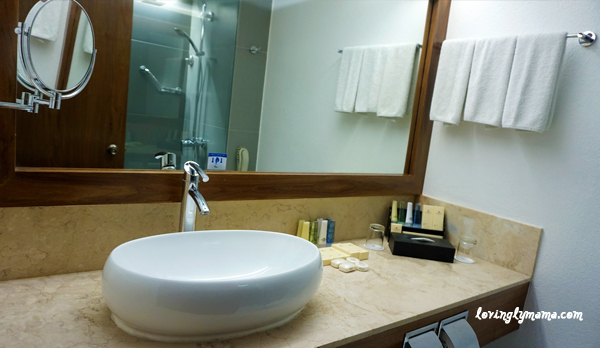 I love the rooms and how the bathrooms are updated at Marco Polo Plaza Hotel Cebu. Any the spa and pools look heavenly. I would love the opportunity to travel to Cebu one day and stay at Marco Polo. wow, the Marco Polo Plaza Cebu hotel looks phenomenal and for about $132 USD that isnt bad at all considering all of the luxurious amenities they offer. I love that pool area and I bet Darcee would love the different parts of the spa. As for the Restaurant, I don’t often wake up for breakfast on holiday but I would be waiting in line for that Breakfast Buffet! That food selection looks amazing! I also like the views, I bet its great to chill at the Blue Bar and just relax too! Indeed, it’s so affordable that my foreign tourists like it here. 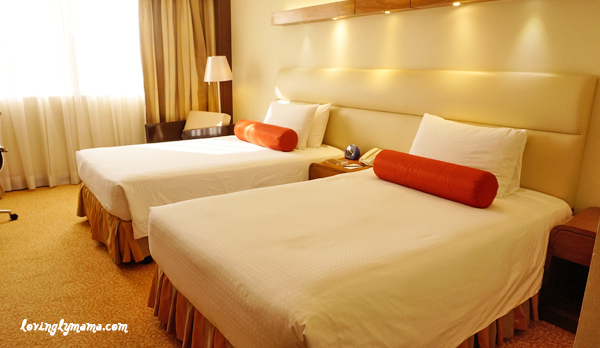 If you can book ahead of time, you can get rooms for lower than $132 at Marco Polo Plaza Cebu. 😀 Come visit the Philippines ! Awesome hotel! I have yet to explore Asia, and the Philippines is one of my dream destinations. With all the wonderful beaches you have there and hotels like Marco Polo Plaza Cebu, it is going to be a must visit place for me. Thanks for the review of the hotel. Looks amazing and affordable, too. I have never been to the Philippines, but I like the Marco Polo Plaza Hotel Cebu very much. And I’m traveling more often with children, so I understand how important it is to choose a family hotel. Great choice! This is the hotel I will check in to when I go to Cebu. What a stunning hotel Marco Polo Plaza Cebu is. It really does look quite luxurious. My children would want to spend all day in the pool. Great hotel review! Lots of insights for family travel. Okay, can I just book a trip now?!?! Haha Marco Polo Hotel Cebu looks sooooo relaxing and perfect for a family stay. I’m jealous you got to go!! I love reading your family adventures. It seems like you always find nice places to stay. The Marco Polo Plaza hotel in Cebu is fantastic! If and when we get to travel to Cebu, I’d make it a point to book a stay in that hotel. Nice and helpful review for a family stay. Wow, Marco Polo Plaza Cebu looks like a perfect hotel to stay, food is good, pool is amazing, and the price is soooo affordable. This is for sure will be my next holiday with my fam. Thx for the recommendations and the great review. This looked like a lovely stay. Philippines has been on my mind for a while now and one of the places I wish to visit is Cebu!!! Hopefully soon and then I will check in Marco Polo Plaza Hotel Cebu. I have never been to Cebu but it looks like a nice city to visit. Marco Polo Plaza Cebu hotel is really beautiful, it look so clean and the ambiance and the people looks very welcoming. This hotel review is so detailed! Marco Polo Plaza Cebu looks like a great place to stay! The rooms are spacious, with lots of amenities. I have never been to the Philippines, but hopefully I can get there some day! I want to go!!!! I am just loving all of your hotel reviews! They are SO detailed – I feel as if I could completely envision myself there. And let me just say your family is so cute! Glad you guys get to relax and bond together at these amazing places like Marco Polo Plaza Hotel Cebu!! See you on your next post! Wow I like that Marco Polo Plaza Hotel has an outdoor pool! Marco Polo in Ortigas only have indoor pool which am not a fan. Impressive review! Wow, love this hotel! Marco Polo Plaza Cebu is a cool and comfortable place to stay with the whole family! I also have to say that it is very affordable, especially if you get to book in advance. They offer good promo on room rates. Definitely the hotel to stay when in Cebu. 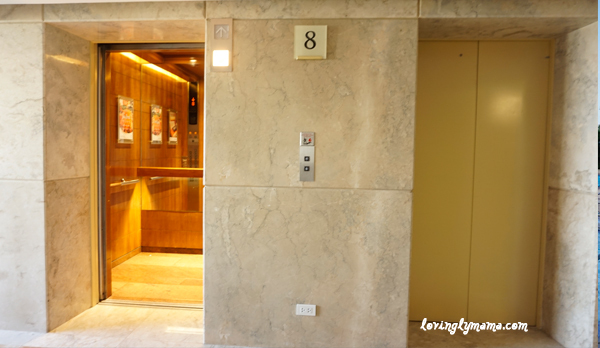 I loved seeing the Marco Polo Hotel Cebu — it’s so luxurious. I also love how big the rooms are and that they have several high end amenities. That pool looks so inviting! Marco Polo Hotel Cebu is one of the nicest hotels I’ve been to when it comes to food, amenities, and staff. 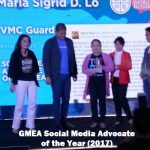 I haven’t had a chance for a staycation there in Marco Polo Plaza Cebu yet, but I did attend a lot of events held at the hotel. Wow that looks incredible! What a gorgeous hotel Marco Polo Plaza Cebu is and the pools look amazing!! I’d love to stay when I visit Cebu! My kids would also enjoy it here. Cebu is one place I can’t wait to visit for its natural beauty that is just outside the city. The Marco Polo Plaza Cebu looks like it would be the perfect hotel to stay in when in Cebu. All the modern amenities in a very nice setting, not to mention great food, and also the reasonable root rates. Cafe Marco looks so stunning! I look forward to experiencing this Cebu hotel property. 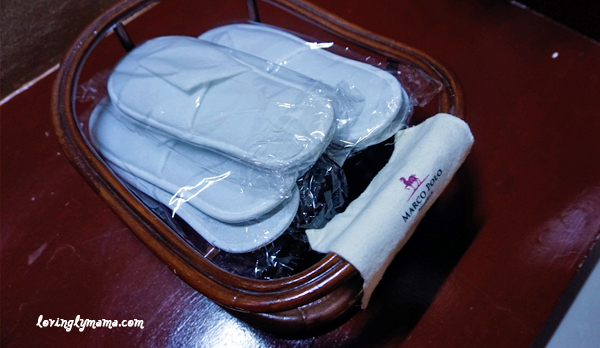 We’ve been wanting to try Marco Polo Hotel Cebu’s services! I am amazed with their pool! Fave part would be the health spa! Thanks for sharing this! What a nice hotel Marco Polo Plaza Cebu is! The outdoor pool looks awesome! I’d love to be there right now ?. You’re really lucky to have experienced staying in that Cebu hotel. Such breathtaking views plus the deluxe room at Marco Polo Hotel will definitely be the one for me. I need a vacation ASAP. Cebu would be a nice place. That! Buffet! When I travel, I like to know if my hotel has a spa, room service, and a pool since I live in NYC and there are no pools here. And Marco Polo Hotel Cebu has all of that! This trip to Cebu for your family looked super fun, props to you for wanting to bring your kids along. I salute you! That lobby of Marco Polo Plaza Cebu is gorgeous! I also love toiletries. I’m such a snob with that. Ha! It looks like you had such a fab time with your family. This is my kind of hotel to relax in. Marco Polo Plaza Cebu looks fabulous! I’m all for places with a great pool, comfy bed, and delicious food. 🙂 Is this one of the best Cebu hotels? If not the best? Beautiful! I love seeing pictures of other people’s travels. Marco Polo Plaza Cebu hotel looks fabulous and your kids looked like they had a grand time there. 🙂 This is truly a great Cebu hotel and what a lovely review! Lovely post about Marco Polo Plaza Cebu! 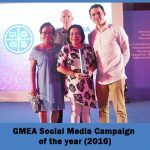 Your article reminded me of my wonderful trip to Cebu a few years ago. Brought back some wonderful memories. Thank you. 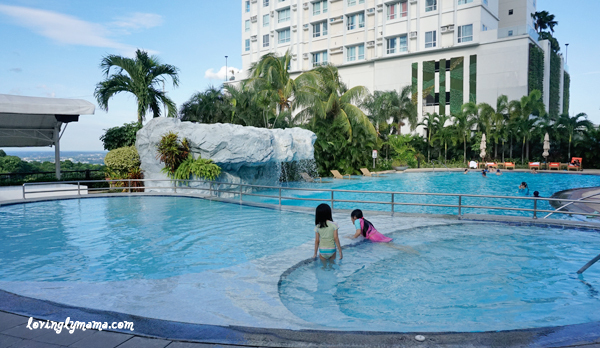 What’s nice is that hotel had its own swimming pool, a fitness centre and spa… Wow, I would love to stay at Marco Polo Plaza Cebu hotel when I visit Cebu, clearly your kids had amazing time staying there. Marco Polo Plaza Cebu is so nice! 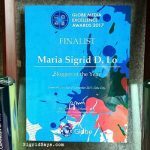 I also enjoyed my staycation in Marco Polo Hotel in Ortigas. The amenities are really great. And I especially love their gym and pool. I’m a fan of indoor pools. 🙂 Their breakfast buffet is also wonderful. You’d really wake up early for that. My husband have checked into Marco Polo hotel Cebu some years ago. Although, it was for a business trip. Knowing him, he is a great foodie. He’s always on the look for a great dining experience which he really enjoyed during his stay. And, he is giving this hotel a two thumbs up. What an incredible hotel, I am hoping to visit the Philippines one day and hopefully I can pass by Cebu. We would like to stay here, as Marco Polo hotel Cebu looks amazing. I’m planning to go to the Philippines – and visiting Cebu and staying in this charming Cebu hotel sounds like the perfect plan. Thanx for the very detailed information and review on Marco Polo Plaza Cebu. Marco Polo Hotel Cebu is huge and they have everything that a hotel need to offer to their guests. Thanks for your honest review it would be a nice reference to those who travel to Cebu City and look for a great hotel to stay. I have never been to the Philippines yet and you have added Cebu to my places to go bucket list. Marco Polo Plaza Cebu looks very comfortable. So probably, when I visit your country and drop by Cebu, I will consider staying in Marco Polo hotel. And by the way, the hotel name is so familiar. Oh. haha It’s probably because the Marco Polo hotels is a hotel chain. 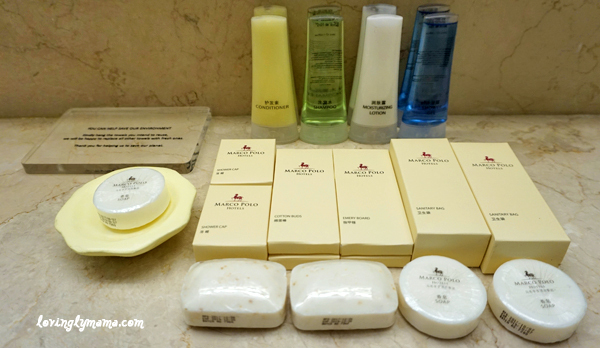 It even has a Discovery program for frequent travelers and guests to the Marco Polo hotels around the world. What an awesome getaway. My kids would love that pool at Marco Plaza Cebu! And I would love that foot spa! What a wonderful place to stay in Cebu. This looks like the perfect place for a family stay! I am sure you enjoyed your vacation in Cebu as you stayed at the Marco Polo Plaza Cebu! Such a beautiful country the Philippines is! Marco Polo Hotel Cebu seems like a great hotel to stay at also! Maybe one day! Marco Polo Cebu looks impressive and relaxing. Definitely worth visiting. Plus it’s worth every penny with all the lovely amenities you have access to. 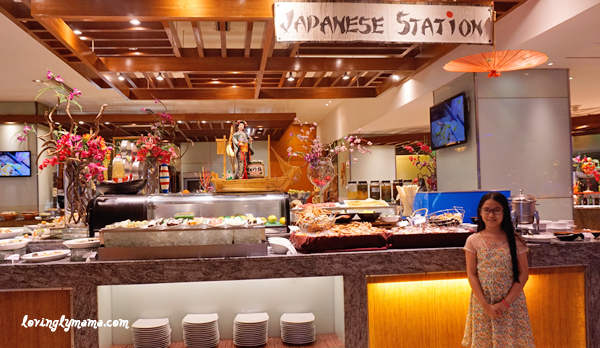 I love the food being served in Marco Polo Plaza Hotel Cebu, especially the Japanese foods on the buffet. I always stay in hostels because hotels are so expensive. Wouldn’t mind paying for this one though. Marco Polo Plaza Cebu looks amazing! And the price is not exorbitant! I need a holiday now, this just made me realise how I have missed going away for a while. I think I need to start planning for my much-needed vacation. The lobby is so beautiful. Marco Polo Plaza is such a great hotel. Good job for a nice and detailed review here. Wow, looks like a great place to stay when in Cebu! This review of Marco Polo Plaza Hotel Cebu is quite convincing. I hope to one day visit the Philippines and stop by Cebu. Marco Polo Plaza Cebu looks like a great place to stay. Plus, the price is pretty reasonable. 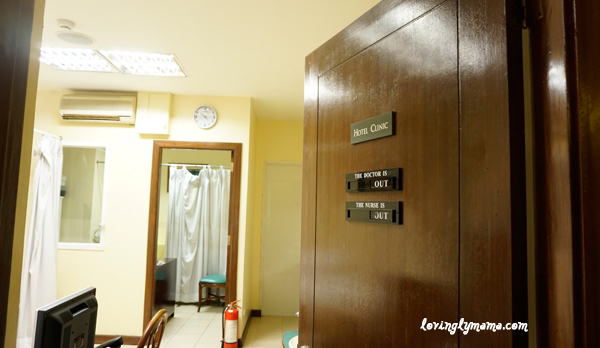 Its seems like hotel Marco Polo Plaza Cebu has everything a family can need on vacation. I am definitely adding this to my travel bucket. This place looks so welcoming! makes me want to travel to Cebu now and stay at the Marco Polo Plaza Cebu! 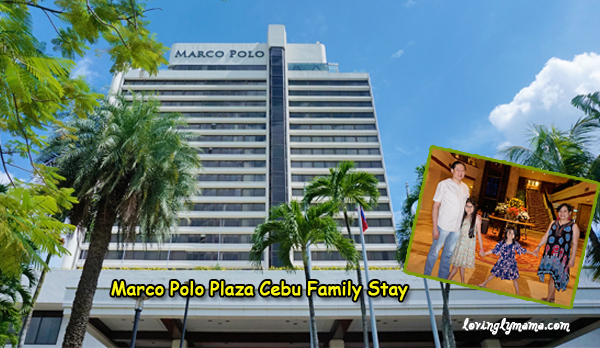 This family stay at Marco Polo Plaza Cebu is simply amazing. You’re right, its lobby is grand and looks luxurious. A family can have a great time here. Marco Polo Plaza Cebu looks like an awesome resort to stay in. Great amenities and the food looks so good! How much is the dinner buffet? Wow! What an amazing and luxurious hotel. Everything and every place in this hotel seem so perfect and clean. This lobby is so huge and undoubtedly looks expensive. The view and structure of the hotel also look beautiful. Marco Polo Plaza Cebu is just awesome! What a great place to stay in Cebu. That lobby of Marco Polo Plaza Cebu is absolutely breathtaking. These are all great photos! The room and pool of Marco Polo Plaza Cebu looked so relaxing. It seems like you had a great time and was able to enjoy yourselves. I’ll have to keep this hotel in mind when I get the chance to visit Cebu, thanks for sharing this review! Marco Polo Plaza hotel in Cebu Looks like a great place to spend a family weekend. The food definitely looks amazing and there are so many things going on for the whole family. I love that Marco Polo Plaza Cebu is so family-friendly. We stay at the hotels that have good reviews like this one. I appreciate the tip off for this one. We will definitely stay here when we go to Cebu. Great review of Marco Polo Plaza hotel!! I have been planning a trip here for sometime and will definitely check this place out while making a booking.